Intelligent. Sassy. Hilarious. Genuine. Worthwhile. 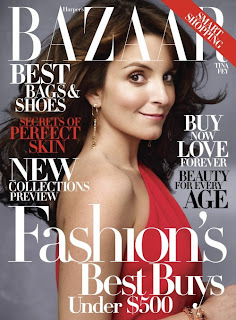 Tina Fey could not be any more different from Harper's Bazaar. Surprisingly, the snotty fashion 'zine has chosen the smart gal's female icon for their November cover. Have they realized that clever, funny gals can be beautiful too, or did they run out of vacuous size 0 zombies to exploit? Despite my distaste for HB, I do applaud their decision to go with Tina. I still won't renew my gift subscription but at least this issue might get more than 5 minutes of my attention. '30 Rock', the brainchild of the incomparable Tina Fey premieres tonight on NBC. I'm not an HB reader but with Tina Fey, I may just buy this issue! Thanks for the info!